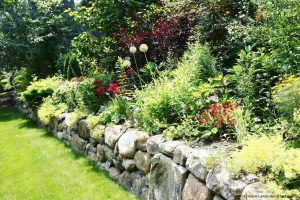 5 Things to Consider When Finalizing Your Retaining Wall’s Design - Fox Hollow Landscaping and Design, Inc.
One of the best was to add structure to a garden is to create borders that separate spaces in the yard. One simple way to do this is to use huge planters as a barrier. However, if you are trying to take your landscaping up a notch, you should consider retaining walls that not only provide a border for your lawn but can also be a way to add to the curb appeal of your home. A well designed, proper retaining walls in your garden can help add a sense of structure to your yard. Building a wall is much more than just throwing a few stones together. Of the many considerations when building a wall, one of the major issues is deciding which materials you plan to use and the actual design of the wall itself. Smart landscapers should make sure they follow all construction codes and regulations, because though retaining walls can be erected very simply, more elaborate walls might require some digging. Let’s take a look at a few key things you need to consider when finalizing your retaining walls design. Today’s landscapers can choose from a variety of materials when designing a wall. Depending on your budget, you can use stone, concrete, timber, or brick walls that meet your home’s needs. In addition to the wide choice of materials available, each of these materials can be cut to fit your design needs and provide your property with the look you want. Timber can give your landscape a more rustic appearance, whereas concrete walls are great for adding a sense of polish and sophistication to any garden. For smaller walls that sit lower to the ground, you might be able to stack the materials without having any problem. However, the taller the wall, the more of a foundation you will need. To ensure that the wall has the required foundations, landscapers will need to dig deeper into the ground. You will need to check with the local authorities to make sure that there are no cable, power, or water lines that might be damaged by digging. Also, depending on where your property is, there might be codes related to where you can and can’t build. Another consideration homeowners should factor in is whether they should use mortar to hold the material together or simply stack the materials. Typically, dry stacking involves stones that can be stacked and held together by pins. Blocks held together by mortar are typically cheaper to purchase but require a lot more work. In order to guarantee that the wall properly drains water, there should be a certain amount of backfill. At least 12 inches of granular backfill (gravel or aggregate) should be placed directly behind the wall for proper drainage. Then, compacted native soil can be used to fill in the rest of the space behind the retaining wall’s design. 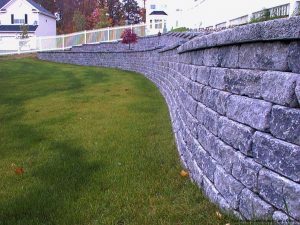 A retaining wall can be an attractive feature to add to your landscaping design. 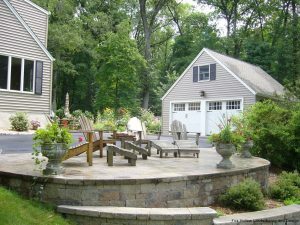 Whether building the wall yourself or hiring a contractor, there is plenty of help for those who wish to make this feature a part of their landscaping design. If considering installing retaining walls for your landscaping project, get in touch with Fox Hollow for a consultation and let us help you achieve the landscape design you’ve been dreaming of.